This individual is not a direct affiliate of the Berkley Center. S/he has contributed to one or more of our events, publications, or projects. Please contact the individual at her/his home institution. Bintou Fouané Samaké is the president of WILDAF Mali, Women in Law and Development in Africa, based in Bamako, Mali. WILDAF Mali has regional offices across Mali (Sikasso, Kayes, Segou, Tombouctou, and Gao). 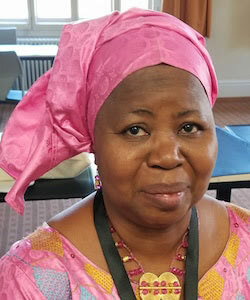 Trained as a lawyer, Mrs. Bouaré has worked for many years to improve women’s legal rights in Mali, offering legal assistance to women, training in women and children’s legal and human rights, violence against women, prevention/care for victims, female leadership, and advocacy. She has contributed to developing curricula and training for a paralegal corps of trainers. Mrs. Bouaré is dedicated to the struggle for gender equality and implementation of the international conventions that Mali has ratified. Sorry, we could not find any results with the search parameter provided.